On Monday the 28th of March Medialab held a seminar in the Atrium Theatre where representatives from Creative Industries, Academics and Animation students gathered to learn about cutting edge developments in Architecture and Animation. The seminar, which was the fourth of four successful Industry facing Animation seminars, was part of Medialab’s ongoing Academia for Business (A4B) programme of events which also include demonstrations of the Atrium’s new HDTV studio, and the GamesLab – Computer Games Development initiative. The first speaker, David Ajasa-Adekunle runs his own Architecture practise, Innovation Imperative. David gave an overview of the potential role of animation as a communication tool for Architects. He explained the way in which Architects already use animation to communicate with clients, for marketing presentations and fly-throughs of their designs, and gave examples of how this is being built up by forward thinking companies, who use animation to communicate the concept, context and purpose of a building. Sqint/Opera is one such company and David showed the audience their presentation for the Velux model home 2020. As the video demonstrates CGI can be used to show the way a building will look in different lighting conditions, and the way it will respond to the seasons and to weathering. In the second half of his presentation David explained the way in which Animation and Architecture can create branding for buildings and projects. Animations help architects to tell the story of a building, be that its history, its purpose, or the ethos of the company building it. For marketing minded people the concepts of narrative and a brand that people can buy into, and feel ownership of, are very familiar. However, according to David this is new territory for many Architects. David gave another example of what he meant by showing the first 90 seconds of a video from developers Urban Splash. Our second speaker was Kate Bergel from Pixar Animation Studio’s Research Group. Kate shared some of the research group’s recent research and development into animation, image processing and visual interface control. Rat-o-Vision (named after Ratatouille’s Remy) is a new technique for simplifying animation through the use of data analysis and abstraction. Kate demonstrated ‘Wiggly Splines’ which is how Pixar developed a quick way of animating ‘wobbly’ characters, such as the rotund inhabitants of the Starliner Axiom in Wall-E. She also showed us smoothed local histogram filters, which provide several useful tools for image enhancement. Of the technical achievements Kate showed us, it was the Eden multi-touch interface, which caused the biggest stir amongst the animators in the room. Eden is Pixar’s new interface for set dressing organic environments, such as the jungle in Up. In response to an audience question Kate estimated that Eden sped up the time taken on set dressing by 20% compared to using Maya and it is hoped it will cause a marked reduction in the instances of Repetitive Strain Injury in set dressers. 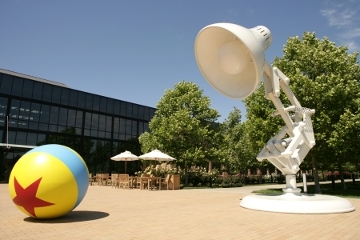 You can find more information on Eden and other Pixar developments at the Pixar Research Group website. Both speakers highlighted areas of their industries that are invisible in the final product but are essential in their development, whilst providing the audience with an informative insight they could not have found elsewhere.